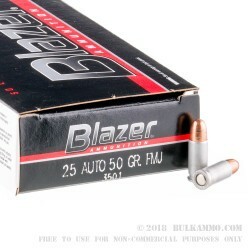 If you ever have to use your backup gun, you'll appreciate the amount of training you got done by shooting affordable CCI Blazer ammunition. 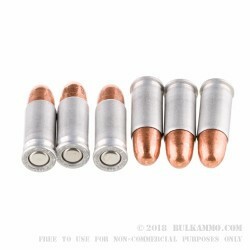 These .25 ACP cartridges come in boxes of 50 and fire a 50 grain copper plated FMJ bullet at a muzzle velocity of 755 feet per second. 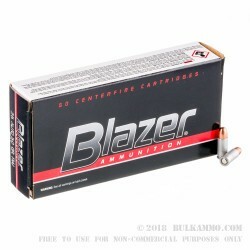 CCI Blazer ammo keeps your costs down with inexpensive coated aluminum cases that provide reliable cycling but are not reloadable. They use CCI's own non-corrosive primers, which are famous for their reliability. 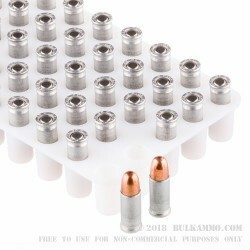 Grab a few of these boxes and keep your skills sharp!